A Euro Steel Building should ideally be built upon a concrete Base or Footings. Depth of Base or Footings depends on the size and use of your Steel Building. As no investigation data is available, it is assumed ground to be compact natural sand, gravel or firm low shrinkage clay below topsoil or fill materials. Design bearing pressure is 100kN/sr.m. Formation soil is to be free from roots and organic material and all excavations are to be kept free from water during construction. For foundations on medium to high shrinkage clays, loose granular soils, made up ground, peaty soils, soft soils or silt, consult Engineers for further advice. Where trees are present or have been recently moved within 25m of the building and the underlying soil is clay, consult Engineers on the risk of shrinkage and swelling due to moisture content and changes in clay. Typically, concrete shall be designated RC28/35 as defined by BS8500. Create a 150mm thick sub base of DoT type 1 compacted fill material. Create a 150mm thick concrete slab with one layer of A252 Steel Mesh approx 50mm from top. General guidance on slab thickness. Where loads are vey light the following rules of thumb can be followed. Minimum slab thickness for domestic situations is 100mm. 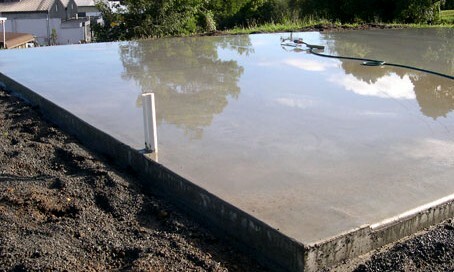 A thicker slab may be needed where loadings are deemed to be greater than above…..seek advice. Where significant racking or pallet storage loading is to be applied to the slab, its performance, particularly its flatness and level, is hugely affected by the condition of the underlying soil. That is to say that a perfectly well designed and constructed slab on a deep compressible clay may settle to a significant extent due to consolidation of the underlying cohesive soil. Therefore, where significant slab loading is required, it is essential that a full and detailed ground investigation is obtained. Joints are necessary in large ground bearing concrete floor slabs in order to control cracking caused by shrinkage. Joints are often installed to force cracks to form along straight, preformed grooves rather than randomly across the slab and hence achieve a satisfactory appearance. The spacing and type of joint selected depends on many factors, principally the slab thickness, the concrete mix design, the length/ plan area of the slab, the method of its construction and details such as edge thickening’s which generate additional restraint forces and hence additional tension within the concrete. Seek advice where and when to install joints from a Foundations Engineer.